Though on first reading it struck me as a little bit like those gimmicky techniques touted to cure male-pattern baldness or maybe Frankenstein’s Monster jolted back to life apparently, via Slashdot, it’s sound and proven that one can accelerate coral growth and hasten the rebuilding of the ecosystems that they support by stimulating them with electricity. The matrices of surviving coral in areas that have been ravaged by cyclones, heat-waves and other destructive acts are scaffolded with galvanised steel frame in order to rehabilitate the colonies, having previously shown that re-growth occurs at a rate three to four times faster than normal due to the current attracting free floating minerals which the coral incorporate. 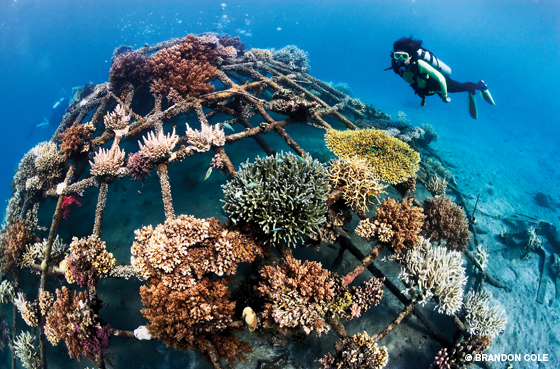 Even with this rapid growth, however, it will take decades for the reefs to fully heal. Visit the links above to learn more and for a video demonstration of divers constructing the underwater frames.